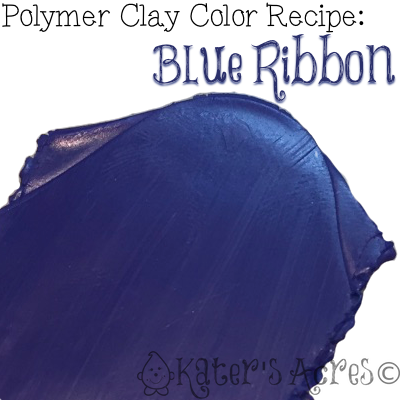 Blue Ribbon polymer clay color recipe for Premo polymer clay is that blue that first place dreams are made of. Reminiscent of country fairs, motor race ways, and 4H clubs. This blue means something … you’ve won! This blue carries a subtle purple undertone that doesn’t translate as well on camera as in real life. This summer I’ve been bringing you a fun color recipe every week. Blues, pinks, greens, purples, and so much more. I’ve been getting some great feedback on how much you’ve enjoyed these on Facebook and I’m so glad to hear how much you like them. It’s my joy to bring you usable, fun, fresh, and lively colors that will bring vibrancy and fun to your palettes this year. If you are looking to make your own and don’t know how or don’t know where to begin, don’t look any further than this article on Making a Color Palette 101. And be sure you don’t miss any of my free color recipes by visiting here. Add 3 parts additional Fuchsia for a purple tint. Add 3 parts additional Turquoise for a mauve tint.